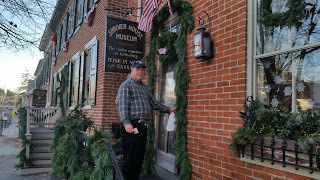 If you're visiting Gettysburg this holiday season, you may want to pay a visit to the Shriver House Museum. 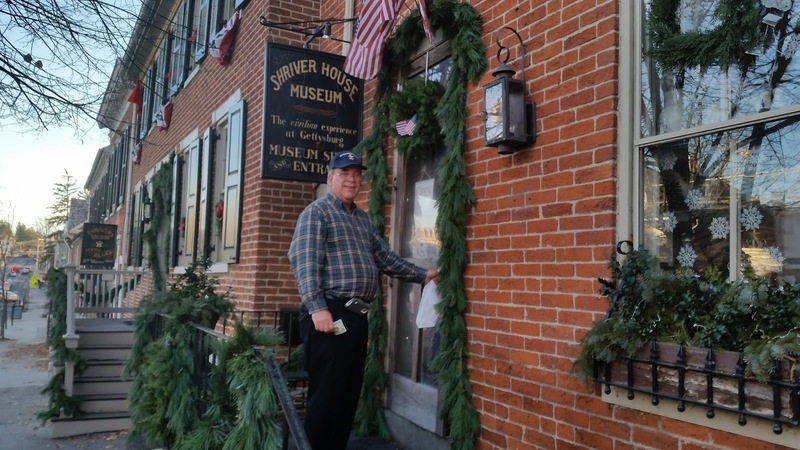 Located in the historic district, the Shriver House Museum exists to educate the public on the Civil War from a civilian perspective. During a recent visit, a docent dressed in period dress told the story of the Shriver family--George, Hettie and their two daughters Mollie and Sadie. The Shriver family were well-to-do thanks, in part, to George's father, who ran a prosperous farm and was in the liquor manufacturing business. He died when George was only 16, leaving him quite an impressive inheritance, which included 3,000 gallons of liquor and a 200-acre farm. Just two years later, George married Hettie Weikert. The couple started a family of their own, selling a portion of his farm to acquire a property on Baltimore Street where the family would reside and where George would operate a business known as "Shriver's Saloon & 10-Pin Alley." 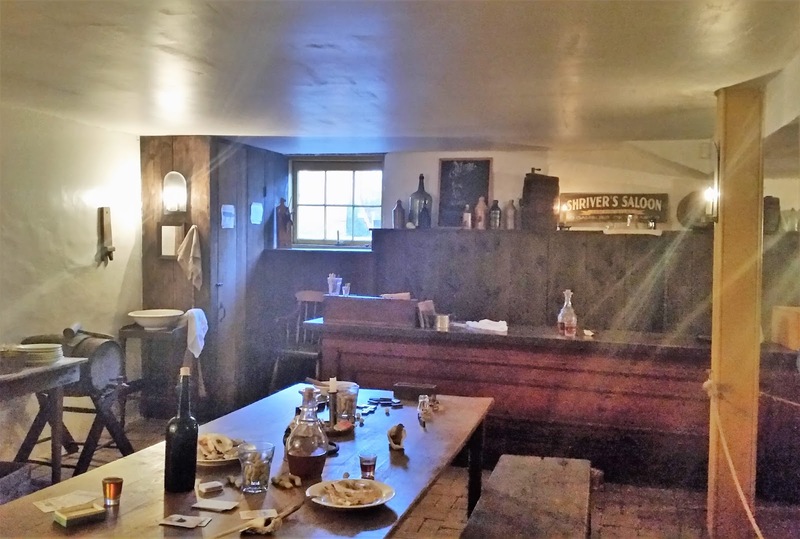 The saloon would be located in the basement of the home and the 10-pin alley would operate in a building erected in the backyard. Just as soon as everything was built and ready to go, war broke out and in 1861 George volunteered to serve. Both he and his wife thought he would be away for a short period of time, but this turned out to be untrue and the businessman-turned soldier served for several years, returning to visit only once before being captured by Confederate soldiers and taken to Andersonville Prison in Georgia, known for its cruel conditions. It was there George died in 1864. Guests are shown the parlor, which today is decorated for the season with a small Christmas tree taking center stage and adorned with simple ornaments, small flags and candles, which we are told were generally lit once. Simplicity ruled the day in the mid 1800's during this time of year and small, inexpensive gifts were usually inserted "on" the tree in between the branches." For a person who always wondered why the lyrics of White Christmas," described presents as being on the tree, this was a moment of clarity for me. 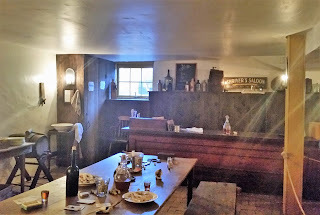 We were shown the dining room where the food was served, Hettie's kitchen with its impressive stove (due to their wealthy economic status), the sitting room and the bedrooms upstairs. A curious thing happened to me outside of one of the bedroom's upstairs when I took the tour. As I listened attentively to the docent, my stomach began aching, causing me to break out in a sweat from head to toe. Too embarrassed to make a scene, I withstood the urge to leave the group, fanning myself with literature I had picked up along the way. When we moved from the area, the pain passed. I have to admit that I have been in all sorts of structures in Gettysburg, including the attic and the basement of the Farnswarth House, alone with just a docent and nothing like this had happened to me before, so I really didn't know what to think. More upstairs rooms in the Shriver House. Docent points out the Necco Wafers in the foreground. So now you know why they taste like the 1830s. As we continued on in our tour, the docent told the story of the family leaving the house, only to return and find that it had been taken over by Confederate soldiers. We learned what scenes the family encountered in the fields surrounding their house and that the odor could be smelled as far away as Harrisburg. Modern CSI detectives using luminal determined that at least two deaths occurred in the attic perch. 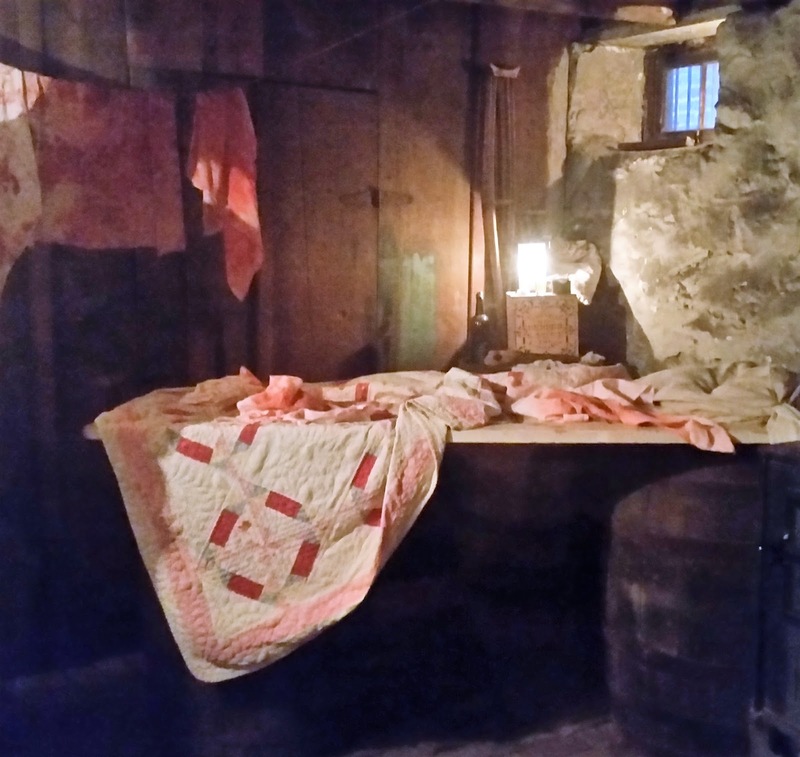 Guests will end their tour with a trip to the basement which leads to an area where a makeshift operating table was crafted out of a piece of wood and two barrels. Just a few steps away is the home of what would have been the Shriver's Saloon, had it opened. Sadly, with the loss of George, the business plans for the tavern and the "10-Pin Alley," never came to fruition. During the summer, guests can instead tour the small, award-winning period garden that is cultivated outside. Next up: A visit to quaint Jim Thorpe, often referred to as the "Switzerland of Pennsylvania."